Background: Silaasaththu Parpam (SP) has been traditionally used for curing kidney diseases and urinary stones. There are no reported scientific studies which provide the physicochemical nature of SP or its raw materials. Objective: The study is aimed at exploring the physicochemical, and anti-urolithiasic characters of the traditional Indian Siddha medicine, SP. Methods: Various methods like elemental analyses, FTIR spectral analysis, X-ray Diffraction Studies, Particle size analysis, Thermal analysis, Scanning electron microscopy (SEM), ICP-OES and Energy dispersive X-ray analysis (EDAX), were used for understanding the physicochemical nature of SP. 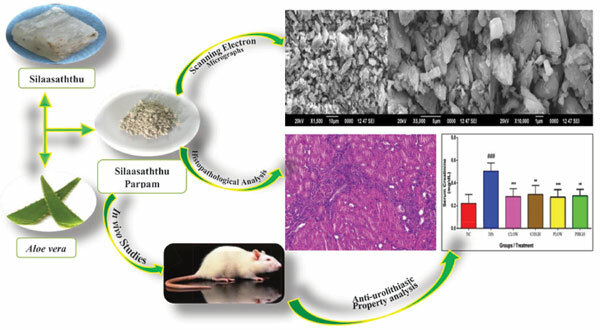 The anti-urolithiasis property of SP against ethylene glycol induced urolithiasis in albino Wistar rats was performed. Result: The ICP-OES analysis revealed the presence of calcium (25.92%), and magnesium (2.05%) as the major metallic elements, while sodium (0.70%), potassium (0.43%) and iron (0.16%) were present in trace amounts. The XRD analysis identified that SP belongs to the orthorhombic crystalline phase of calcium sulphate with an average crystallite size of 35.55 nm. The mechanism of thermal degradation during the calcination of the raw sample treated with Aloe vera juice to get SP is understood by thermal studies. The pharmacological studies revealed that the elevated levels of various biomarkers in serum and urine samples were reduced by treating them with SP for 28 days. Conclusion: The physicochemical nature of SP, biosynthetic method of fine particle preparation using Aloe vera and ethnopharmacological action investigated in the present study highlight the proper application of modern scientific approaches for developing new insights into metal based traditional medicines. Siddha, ICP-OES, XRD, SEM, TG/DTG, Urolithiasis, Histopathology.